Thus Bad Begins (published by Hamish Hamilton) is set in Madrid in 1980, where the Franco era has ended and people are beginning to explore the new freedoms available. One of those people is the narrator, Juan de Vere, a young man working as a general assistant to film director Eduardo Muriel (a stern gentleman in his late forties with a dramatic patch over one eye). Juan’s role entails spending time at the Muriel’s apartment, and it isn’t long before the young man notices Muriel’s cruelty to his wife, Beatriz, a beautiful woman whom the husband insists on insulting whenever possible. Thus Bad Begins is very clearly set in 1980, and with good reason. Marías has placed his story in a country moving on, but not yet completely free of the influence of the right (and of the church). As a result, divorce is as yet unavailable, meaning Muriel is unable to free himself completely from his onerous marriage. This is also a time of sexual freedom after the restrictions of the previous decades, as Juan (who is narrating looking back from the present day) explains several times, also stressing the permissive atmosphere prevailing in a pre-AIDS era. The reader senses that this information may become important at some point, but as always in Marías’ work, we’re not quite sure how. Juan starts to delve into the past, wanting to know more about the two secrets he has become aware of: Van Vechten’s offences and Beatriz’s betrayal of her husband. As he goes about this task, two themes, both familiar to Marías readers, emerge from the confusion. The first is concerned with the ghosts of the Spanish Civil War and the way in which abuses have been covered up; the other is sexual power, with the writer fascinated by the allure of aggressive men. The two combine, and we’re never quite sure which is going to be the main focus of the novel. 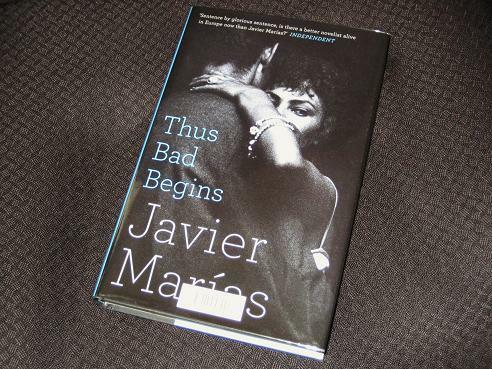 It all makes for an interesting story, and yet any reader with more than a passing acquaintance with Marías’ work will be a little disappointed with Thus Bad Begins. Yes, there’s still lots to like (the usual languid pace, long conversations and a palpable sense of abuse of position), but there’s a feeling we’ve been here before. Perhaps having read Your Face Tomorrow recently adds to this feeling as the themes are certainly similar. In the trilogy, Marías also wove the abuses of the civil war into his story, showing how those who brutally eliminated their opponents later pretended they were the good guys. There was this same fascination with sexual power, women caught up in a spell, hypnotised by the naked aggression, unable to free themselves. You can’t help but have the feeling, though, that this is a pale imitation, Marías by numbers – the question, of course, is why. While the writing is excellent in parts, it’s not always up to the standard we’ve come to expect; at times, it appears cheesy and clichéd (perhaps partly due to the youth of the narrator at the time of the story). Perhaps the subject matter adds to this feeling, with much of the book being rather obvious and crude (on occasion downright creepy). As always, there’s a hope (perhaps even an expectation) that the ending will tie everything together, but in truth, this time it comes as a bit of a let down with no real surprises. The book gently meanders towards its conclusion, in a style less Marías than that of Anthony Trollope’s Barchester novels. Another aspect of the book I found successful was the sinister characterisation of Van Vechten. Marías successfully sketches out his main antagonist, a true wolf in sheep’s clothing, leaving us in no doubt as to the doctor’s capacity for the evil Juan suspects him of. While the good (?) doctor is certainly larger than life (with teeth suitable for a big, bad wolf), he never slips into parody, remaining a fascinating individual. Anything like the use of Balzac in The Infatuations? That was the only part I truly enjoyed. Well, that and the comedy about publishing. And the scene with Professor Francisco Rico, obviously. Is he in this one? I wonder what game Marías is playing with those names – Juan de Vere? Jorge van Vechten? Tom – Not really, not to that extent, anyway (unless, as is eminently possible, I completely missed it). The names are all to do with foreigners, people whose ancestors came to Spain – whether that means anything is another matter entirely. As for the Professor, yes, he’s quite a prominent figure -having read ‘The Infatuations’ about four years ago, I’d entirely forgotten that this was the same man!